To develop an awareness campaign for ‘@ your library’ with the aim of keeping libraries in the minds of the public, library users, funding bodies and policy makers. The campaign needed to be broad enough for all libraries large or small, metropolitan to rural. Utilising a combination of visual elements and imagery Sauce Design was able to develop a look and feel that was fresh, new and exciting and could easily be implemented across a wide range of materials while still maintaining a consistent look and feel. 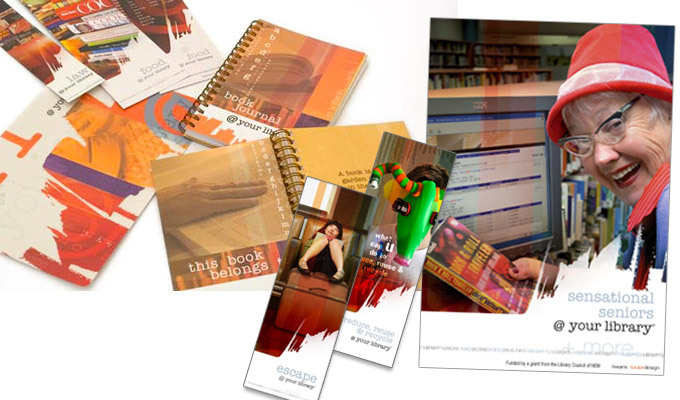 Over 25 individual campaigns in NSW were successfully branded and the design, which evolved over time has been applied to an extensive range of printed resources including: posters, postcards, bookmarks, tattoos, websites, mouse mats, book journals, banners and stickers. The campaign was also taken up by the State Library of Queensland and a new range of individual campaigns were developed.